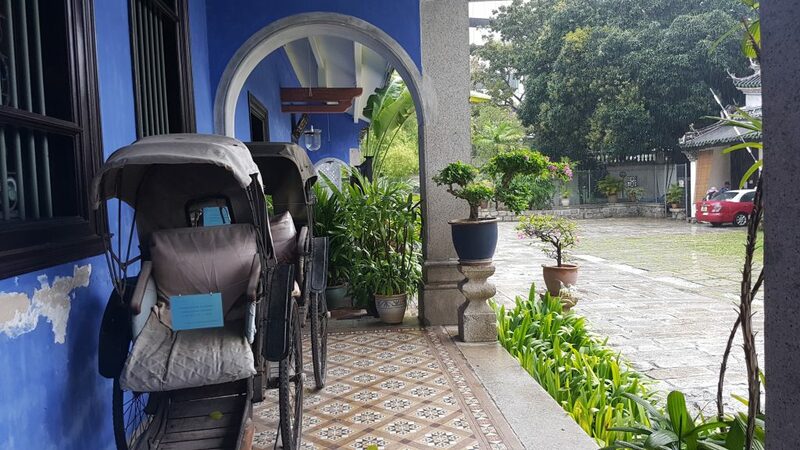 If you haven’t read my other posts about this trip please click Welcome To Malaysia, Masjid Kapitan Keling, Penang Street Food, Armenian Street Art & Teochew Chendul and Chocolate and coffee Museum. As I mentioned in my previous post, I had a bit of time after visiting the Chocolate and Coffee Museum before I could attend my 3:30pm viewing of the Blue mansion. 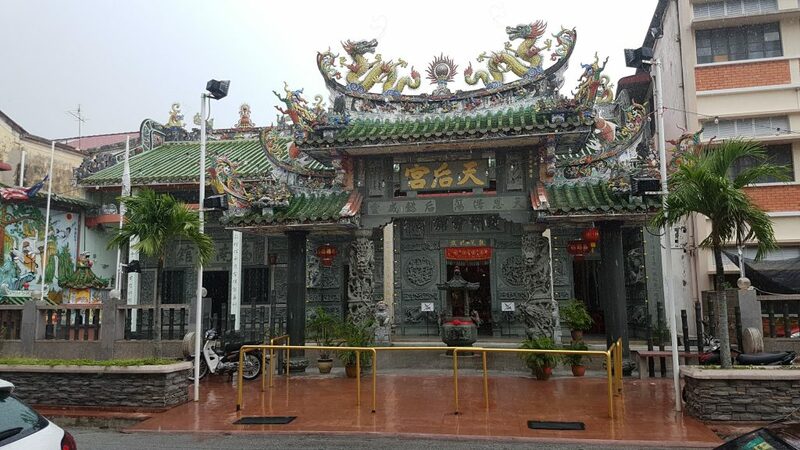 As I was walking around the neighborhood and trying to find shade from the sudden downpours, I happened across this magnificent Temple smack in the middle of a residential area, sitting across from this hipster coffee shop. Well I didn’t need to think twice about it, I decided what better view than this to sit out the rain—or in my case stand! After a few minutes, a few passing travelers joined me and in that moment it was like we were all transported to the set of a 1800s movie set somewhere in Asia! After what seemed like forever, the rain stopped, so I made my way to the mansion which was a few minutes away. There I met a few people waiting and we stroke up a conversation. Unfortunately, a few minutes in I experienced the heaviest Rainfall yet, it seriously felt like a typhoon. The rain poured mercilessly and we scurried to find shade but found out we still had to buy tickets before we were allowed entry into the Mansion. The poor Security Guard had to provide Shelter for four foreign looking women in his little shack, he sold us our tickets and each person ran into the rain aiming for the front veranda of the mansion. The winds was blowing the rain in all directions and at this point my umbrella felt useless. I was literally dripping wet and this was all within the span of about 5-10 mins. This type of heavy but short downpours seemed like a normal occurrence in Penang because not long after the rain stopped. But I guess my luck was run out because here I was in this fancy artsy Mansion dressed in my patterned Salwar Kameez to match but soaked wet and dripping water along the hundred year old imported tiles from stoke-on-trent! Luckily my over prepared self had a pack of tissues in my bag which I used to try to bring back some grace to my appearance. I walked outside to check out the front courtyard and It was beautiful! Sitting Pretty on the corner of Leith Street in George Town, the Blue Mansion carried history of beauty and elegance. The place had displays of old rickety pull carriages and stone works that were restored to almost original state and true to its name the walls were covered in the bluest indigo. There were lamp shades scattered around with intricately designed glass panels in the 220 windows scattered around the place. In its glory days I bet this was a sight to behold! There was still time left before the tour and people started piling into the foyer where there were paintings and wall hangings plus vintage looking furniture and vases displayed. This all reminded me of the castles I had visited back in England. A few minutes later, the tour guide signaled for everyone to gather round for the tour to begin. 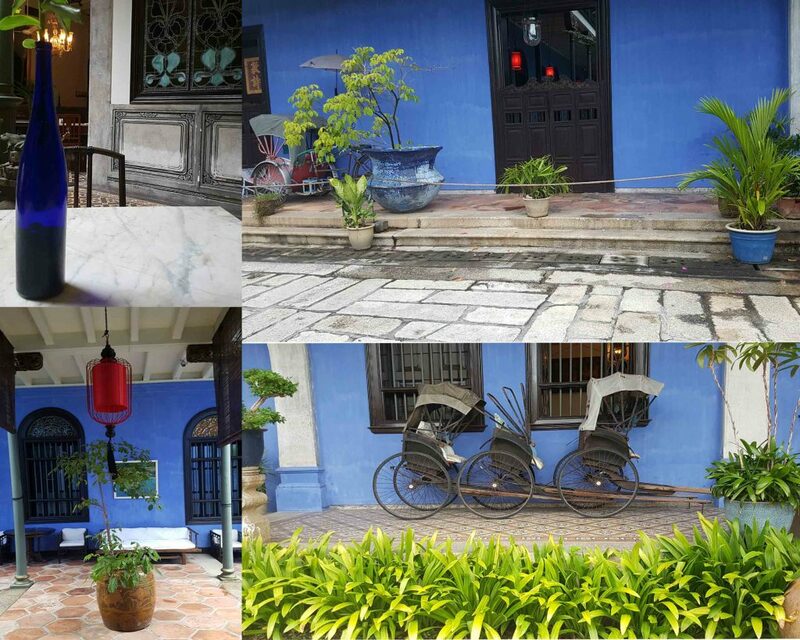 After a few introductions and everyone said where they were from, the history of the Blue Mansion began…. 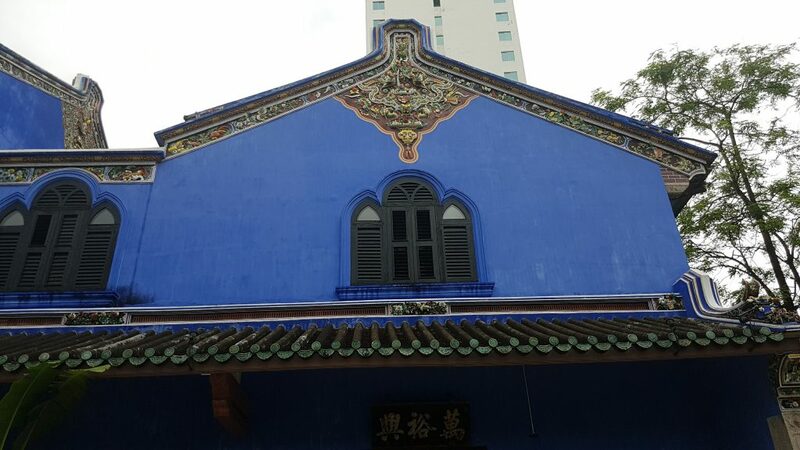 Back in the late 19th Century lived an eccentric businessman and politician by the name Cheong Fatt Tze, who dreamed of building a magnificent and elegant family home for all his descendants to reside in. He was born into a poor family in southern China and rose to become one of the most influential man in South-East Asia! 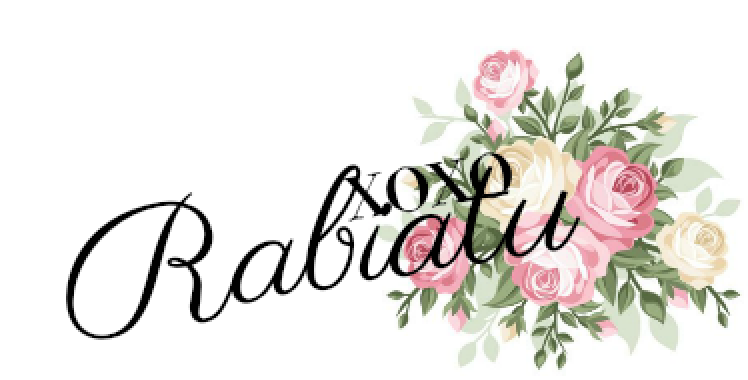 Goals anyone? The house carried a lot of details that screamed of his ancestral birthplace and seeped of heritage and tradition. Legend has it that the house was the most detailed and lavish building at the time outside of China, and because of his desire for authenticity in the architecture, every little detail was sourced from the best of the best from stonework shipped from Stoke-on-Trent to artisans brought in from china who handmade the details on the walls. Now that is some determination!! 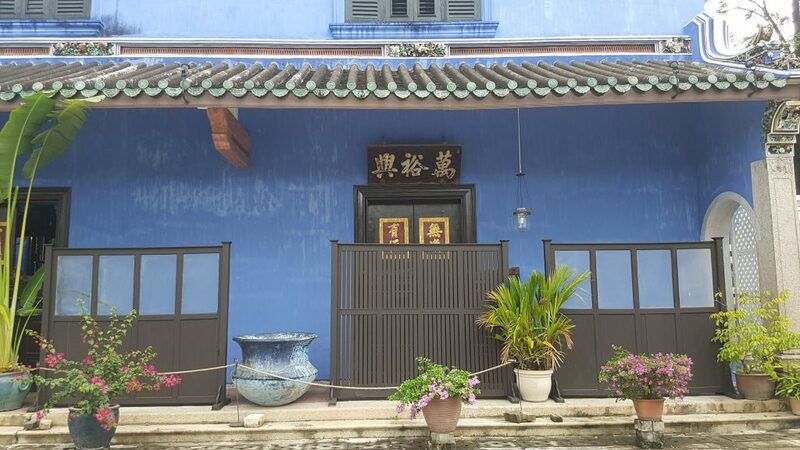 The elaborate beauty was home to Cheong Fatt Tze’s most favoured wife, Lady No.7! It had everything from stables to staff quarters and was the centre of the social circle in its glory days—think great Gatsby, Chines Style. 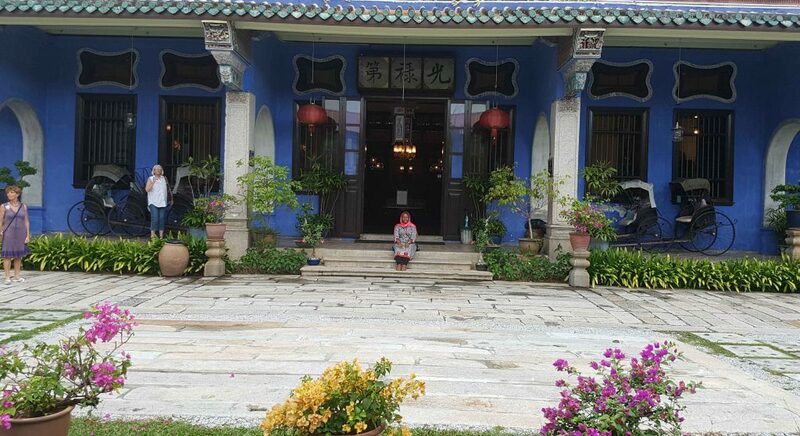 After building all of this fancy space, Cheong Fatt Tze devised a plan to keep the house in the family but due to mismanagement and some shady dealings, the funds ran out and the house fell into a state of despair. With no money for maintenance, the lands started being sold off until all that was left was the main building. 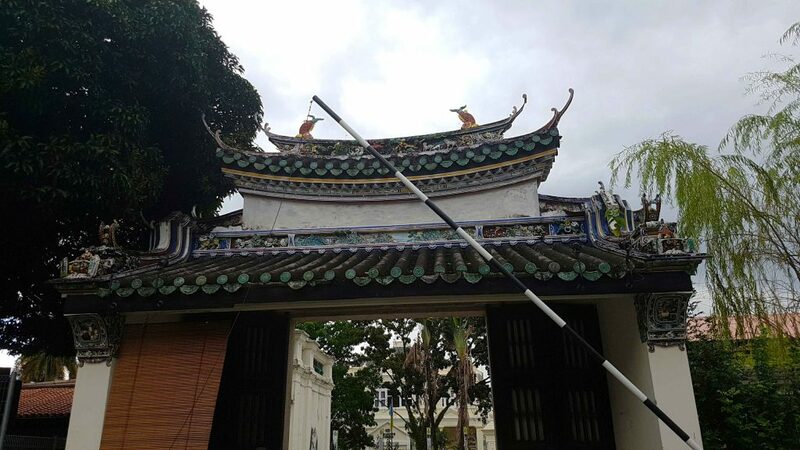 Both the British and the Dutch authorities ordered flags to be flown at half mast to honour the man who was known as “the Rockefeller of the East” – of Cheong Fatt Tze. 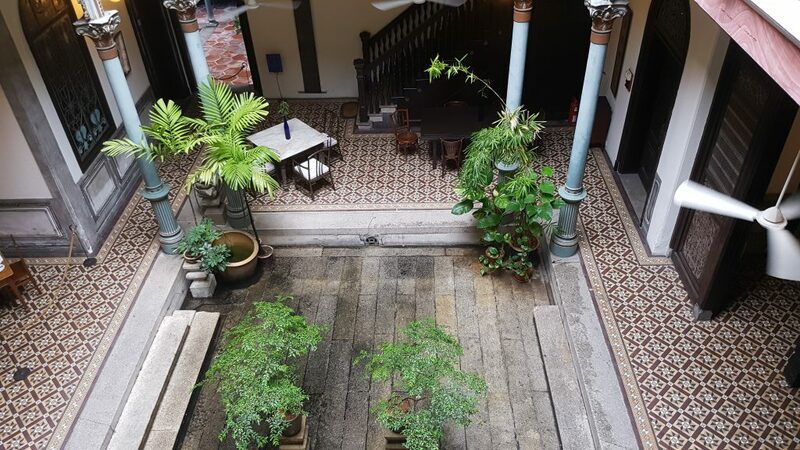 At this point in the tour, we had moved into this inner courtyard and the tour guide was telling us more about Cheong Fatt Tze the man and his larger than life personality as well as Cheong Fatt Tze, the mansion. If you notice the house was designed to serve as many people as possible, and for some reason the architecture reminded me of the description of Shang Su Yi‘s house in the book Crazy Rich Asians by Kevin Kwan. If I would Imagine Tyersall Park, I think it will have a lot of elements of the Blue Mansion but in a more subtle state. By this time, we had moved upstairs and I was highly disappointed to find out that the tour only had one room left because the innermost part of the building has been transformed into a 16 bedroom Bed and Breakfast, as such closed off to public viewing. We walked into a room filled with clothing mostly from his beloved wife No.7 whose family inherited the mansion. You could tell she was a fashionable lady and loved to socialize. It was interesting to see that a lot of the fashion today was carried onward from a time before now. There were also pictures of other family members as well as the kids nannies who we referred to by a certain name which I cannot recall, but you get the gist. There was a hallway that carried information about the man and the restorative work that was done on the mansion. To say it was in ruins seems like an understatement. The mansion was almost bulldozed off until a group of Architects bought it and invested in its refurbishment. They tried to stick to the original architecture and design as much as possible which earned them numerous awards and got the mansion into the prestigious UNESCO World Heritage Sites list. After hearing about the love, sweat and dedication that went into building and re-building this piece of Architectural Art, I came to view it in new light and appreciate it more. Before we exited the building, we came across a music video being shot in one of the closed off hallways, it was fascinating to watch. I later found out that pre-wedding photo shoots, actual weddings and other events were also held at the mansion. Imagine pretending like you are in the 50s through photography and location, how fab right! Thought I should at least have a memory of this visit which started out as a whirlwind adventure—literally—and ended up leaving me in a nostalgic state. so here I am sat at the main entrance with my complimentary matching Salwar Kameez..
And this right here was the door leading out of this adventure. 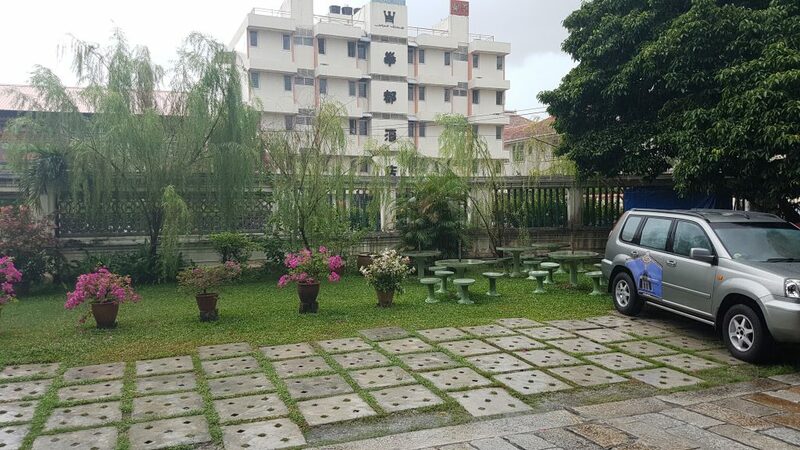 Found out the hotel I was staying at sits on the grounds of part of the former Cheong Fatt Tze Palace—yes with the description I heard earlier on, the place was fit for a king, and I think he was close to that! 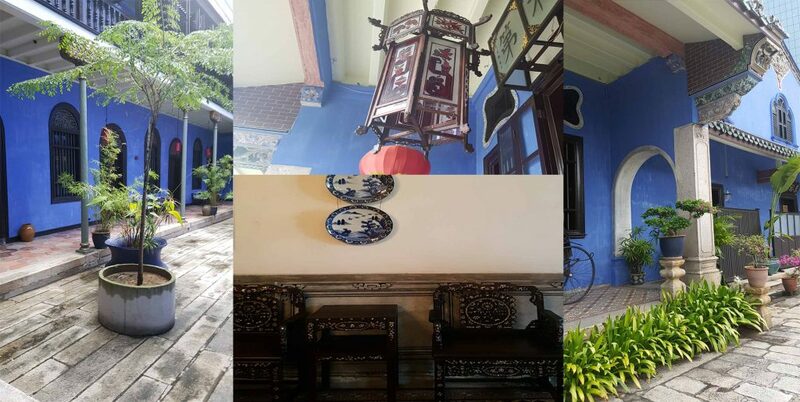 Hope you enjoyed reading the post, I tried to not go into too much details in case you decide to visit the Cheong Fatt Tze Blue Mansion. They offer tours in different languages with the English tours given 3 times a day. Entry Fee: 17 Malaysian ringgit per adult, 8.50 per child under 12 years. 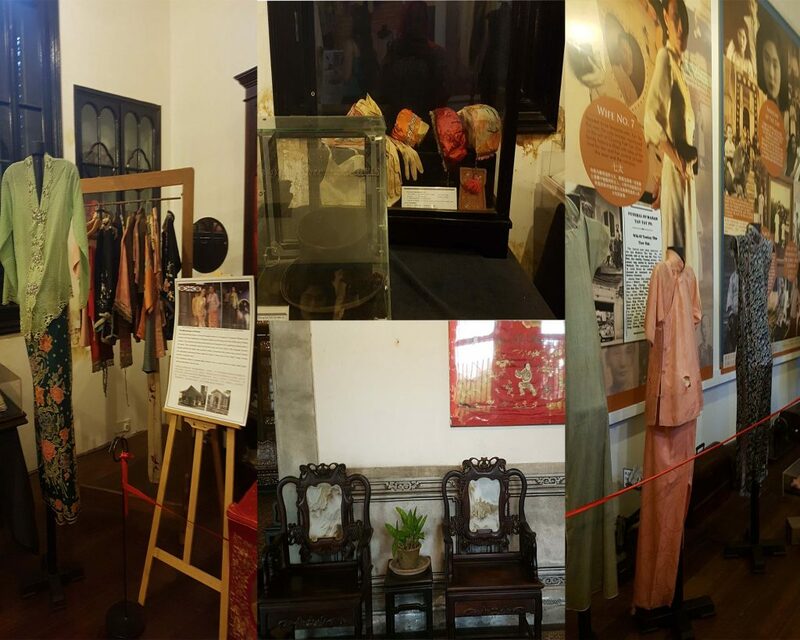 For more information, visit the Cheong Fatt Tze mansion website.